GIBRALTAR has competed on the world stage and come away from the Gourmand World Cookbook Awards with unprecedented success. Mama Lotties – Gibraltarian Inspired Recipes – the brainchild of graphic designer Justin Bautista, 25, came third in the self-published category. Bautista developed the book from a recipe sharing website created in his London student digs when he missed his Grandmother’s home cooking. It has since snowballed in popularity and the book lost out only to Barbados and Canada (first and second respectively) in competition with a total of 205 other countries. “I am very proud of Gibraltar to have achieved such a level of recognition and to share a part of its culture internationally,” said Bautista. “Having been nominated alongside 205 countries, little did I expect for Gibraltar to be shortlisted, let alone reach third place alongside Barbados and Canada. “This is just the beginning as we can show the world that Gibraltar may be small but our culture is vast and varied,” he finished. 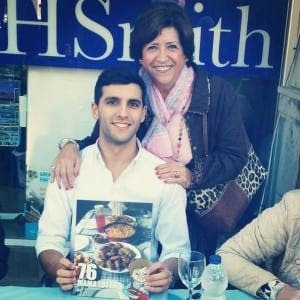 The book is available online through www.mamalotties.com and Bautista will also have a stall at the famous Gibraltar Calentita Food Festival on June 20 at Casemates Square. Next articleMusic and fashion charity night in Estepona!